With summer comes lots of travel plans! We’ve been keeping busy by loading up our travel trailer and camping all over Minnesota. It has been an absolutely amazing time with lots of memories made and tons of family bonding. Getting to each campground brings it’s own set of challenges though! 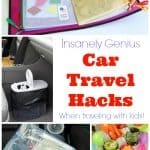 Our kids aren’t big fans of long road trips so I have a few tricks up my sleeve to make traveling with kids a breeze! Here is an awesome travel snack hacks idea that you need up your sleeve! If there is one thing that is common among kids of all ages, it is their love of snacks! 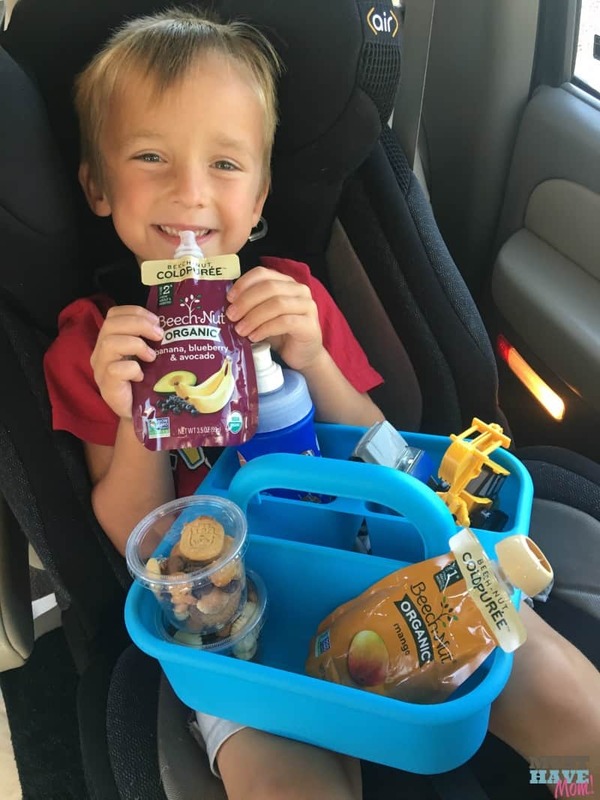 One of the best ways to keep my kids happy on a long car ride is to have plenty of snacks on hand! 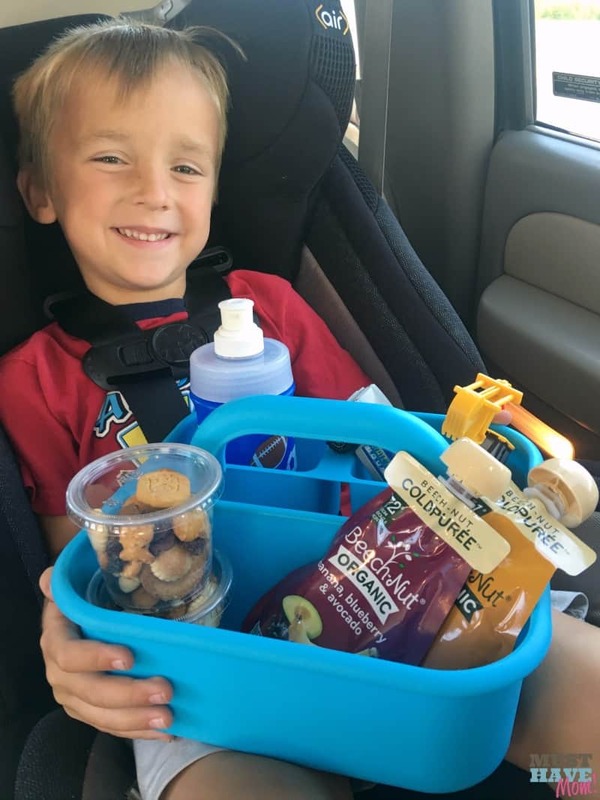 I’ve got a kid-pleasing, mess-free snack mix recipe I’ll share with you along with some fun ways to transport the snacks in the car for easy snacking that kids can do themselves. These travel snack hacks will help you reach your destination tantrum-free! 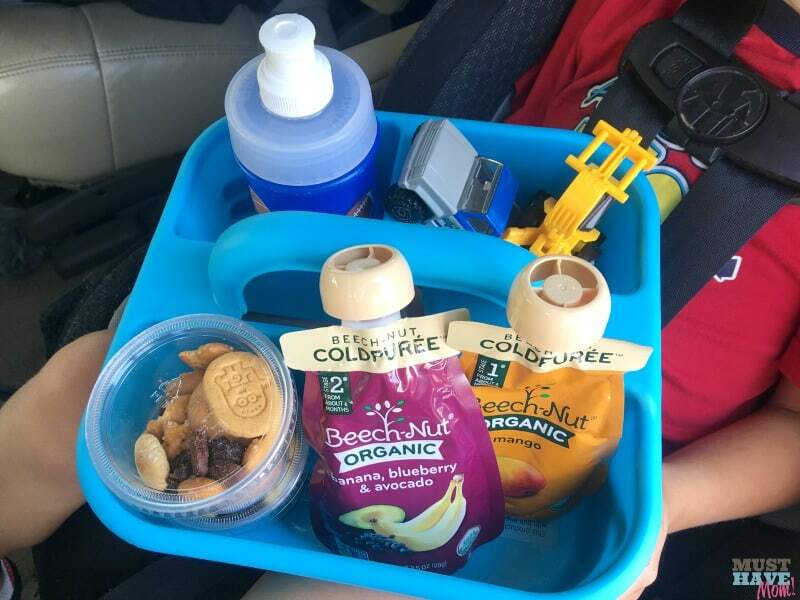 Add in this ingenious car travel caddy travel snack hacks idea and you’ve got a pleasant road trip ahead of you! First whip up a batch of this kid-pleasing snack mix. You can use anything you like! This is also a great way to clean out the cupboard when you have nearly empty bags of snacks sitting around! I’ve found that it’s best to stay away from anything that will melt if you are traveling in hot weather. In cooler weather we tend to add in yogurt-covered raisins, etc., but in hot weather we’ve found that those make a mess! 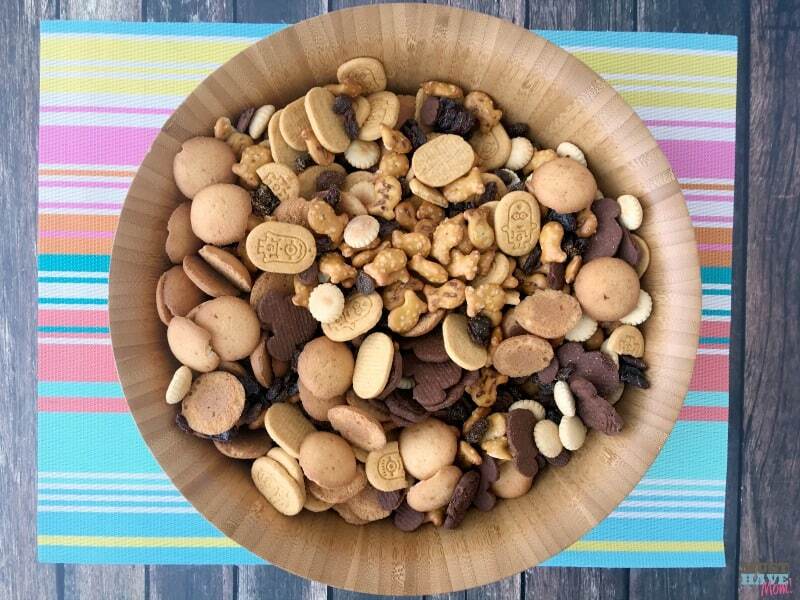 For our mess-free snack mix I combined a box of mini vanilla wafers, a bag of pretzel crackers, half a bag of oyster crackers, raisins, organic animal crackers and organic chocolate animal crackers. You could also throw in some other dried fruit like bananas, blueberries, cranberries, etc. if your kids are old enough to manage eating them safely. Mix it all together to combine it. 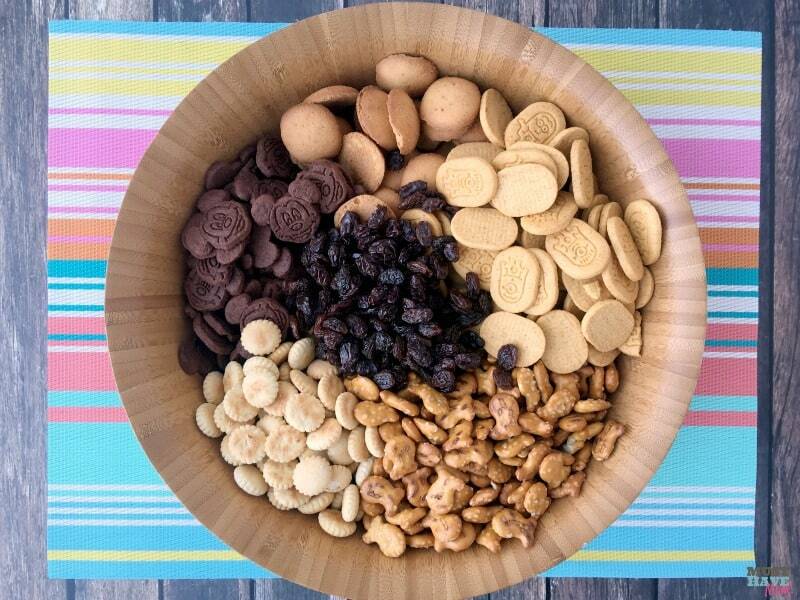 I love using dried fruit in place of candy treats in the snack mix. We often have trail mix and my youngest son always picks the candy coated chocolates out of it and leaves the rest. With this snack mix I don’t run into that problem! Next, use a slotted spoon to fill up snack size plastic cups with lids. If you use a slotted spoon, all the crumbs will be left behind so your snack cups won’t be full of crumbs! I picked up these inexpensive, snack-size containers with lids near the paper plates aisle. This gives you a perfectly portioned snack in a container that your little one can easily open and shut themselves. 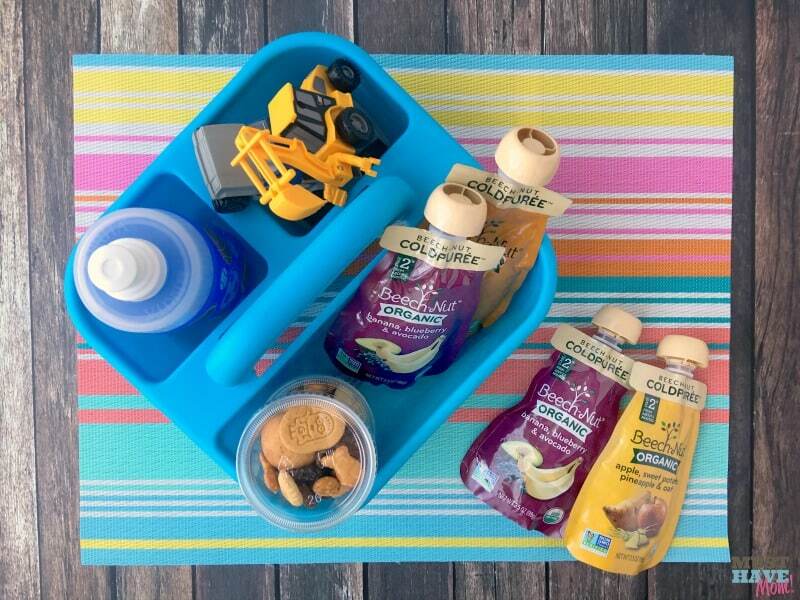 Setting your kids up to be able to help themselves is an important tip to achieve travel snack hacks success! Now pick up an inexpensive caddy (find them at the dollar store or in Target’s dollar spot) and fill it up! Add your snack cups, a water bottle (we used these filter bottles so we can refill them anywhere! ), a few small toys and a couple of Beech–Nut’s ColdPuree Organic pouches. Beech–Nut’s ColdPuree Organic pouches are the perfect delicious and nutritious travel treat for on-the-go kids of all ages 6 months and up. They are a mess-free car snack hack! The lid can even be placed back on the pouch if the kids don’t finish it. All of my kids from my youngest to my oldest (she’s 8!) love these Beech-Nut pouches. It’s a really easy snack hack for serving up the fruits and veggies your kids need, without the mess or preparation! 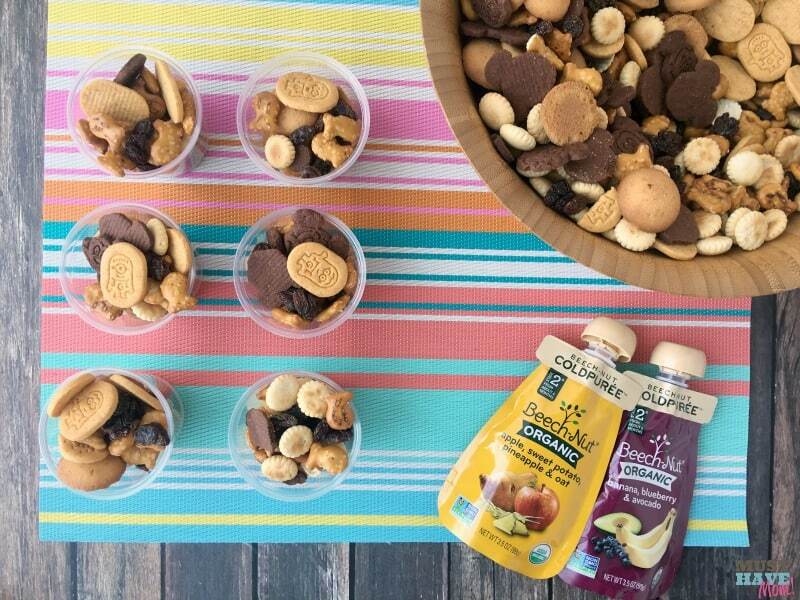 Another travel snack hacks tip is to limit how much liquid you serve your kids. Now I don’t mean dehydrate them, but don’t give them an excessive amount of liquids or you’ll be stopping for potty breaks every 20 minutes! Hop on over and follow the Beech-Nut social channels for even more real food “sanity snacks” ideas. These real food snack ideas are a great way to avoid falling into the too-easy trap of serving up convenience foods like chips or candy. Avoid the junk, and with a little planning ahead, you can easily serve up nutritious snacks instead! 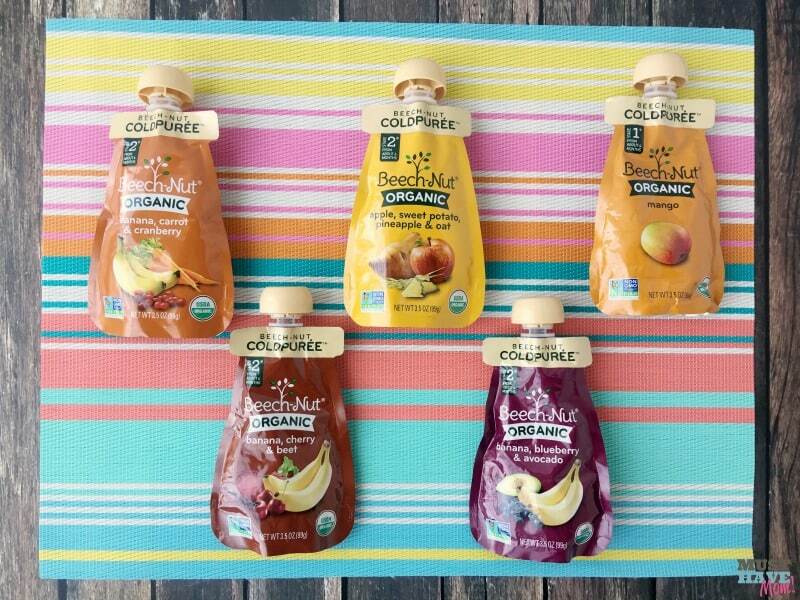 Beech–Nut’s ColdPuree Organic pouches hit the shelves at select Target stores in late July. You can find more information, including where they’re available near you, from Beech–Nut’s website. What travel snack hacks do you have? I’d love to hear your favorite ideas or snacks for on the go! We always take road trips without the kids, but my oldest recently asked if we could start taking road trips with her and her brothers. 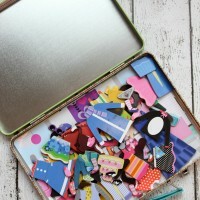 This is a great way to keep them occupied and full on the road trip when we do take them along! I love the Caddy that you have it in me. That is such a better idea than a bag everything is separated. We love going on road trips and we love snacks to go on the road trips! Some of these look really good! When it comes to travel with kids, you must prep the snacks in advance if you want to have a headache free trip. You shared good tips and good snack ideas here. Having a container to keep all the snacks available and less of a mess helps. We spend a lot of time in the car during the school year, so we need to stock up on snacks. This is brilliant, thank you for sharing! We have a 13 hour drive coming up in a few months and this will be great. Love the trail mix! 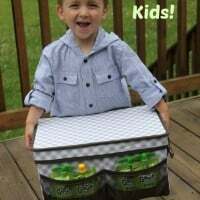 I love that you put a caddy in the car – need a trash too for my crazy kids! 🙂 However, I love the toolkit! This is a lot of fun! What a perfect idea! You bet I will be buying 2 of these for the van! Thanks! I’m glad you found it so helpful. I have a few for us! They come in handy. We always take lots of snacks on our trips, but I’d never thought about doing a snack caddy. That’s a great idea! This is a great idea. Will have to pass it on to my son. 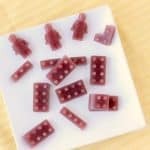 These are great ideas, I will definitely share this with my friends who have young kids. The snack ideas are healthy too.